Nike Epic React Flyknit are neutral cushioned running shoes. 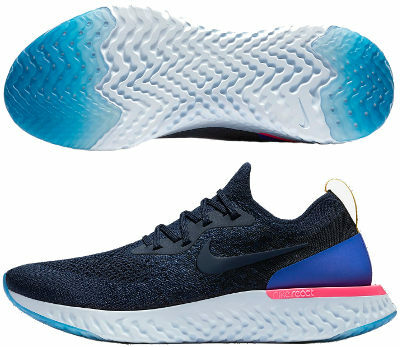 The innovative Nike Epic React Flyknit is the most interesting response from the popular american brand to all midsole foams released by competitors: Boost by Adidas, Fresh Foam by New Balance, EVERUN by Saucony, FlyteFoam by Asics, etc. The german brand in partnership with BASF has not only shaken the running shoes market with Boost foam but also gained huge market share in sneakers (casual) one with eye-candy Adidas Ultra Boost so it makes sense that Nike launches a worthy rival. Although the new Epic React Flyknit shares maximalist look (and crazy price) from previous Nike marketing hype Zoom Fly, the most interesting part in Epic React Flyknit is the completely new midsole foam (codename React) which should become midsole's baseline (maybe alongside ZoomX from exclusive VaporFly 4%) in next Nike running shoes. Although major highlight in Epic React Flyknit is the brand-new midsole foam, there are several enhancements to well known Flyknit fabric from Nike in the upper. Based on bootie construction for improved fit and soft feeling, forefoot is plenty of ventilation holes to promote ventilation for right breathability and Nike decided to get rid of typical FlyWire cables (already present in many Nike running shoes like Pegasus 34) and relies in stretching capabilities from mentioned Flyknit to provide snug fit. In order to improve stability there is a plastic piece around the heel (larger than in Adidas Ultra Boost ST) which also makes the upper more colourful. New Nike React is a synthetic rubber compound (not EVA based like most foams out there), the result of several years of research and development. As expected, marketing pitch offers several improvements (lighter, more reactive, more durable) than current foams from Nike (even softer than LunarLon featured in cushioned Vomero 13), so it is mandatory to wait for fedback from unbiased runners to have a reliable opinion about it. Besides eye-candy look, engineered geometry from multiple grooves available let the Epic React Flyknit adapt better to different pressure forces through complete gait cycle based on exceptional flexibility, something that raises some concers about stability though. Outsole configuration is as well different to everything seen so far with full-length contact foam and includes just a couple of harder rubber units on both front and rear areas to improve grip and increase durability.